Life in the small town of Emerald Springs, Washington, is anything but slow and peaceful. An old feud between former business partners Whitman and Sanders keeps competition on a high burner, fueling resentment, renewing rivalries … and love. 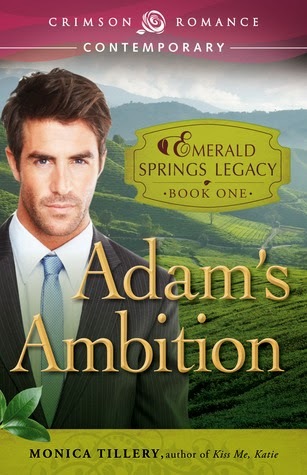 Now someone is trying to bring down Emerald Tea Farm, and it’s up to both families to protect their future while still wrangling over the past. Oldest son Adam Whitman never planned to take his place at the helm of the family business, and he’s living the life he always wanted. When his father asks him to come home to consider his options, he reluctantly leaves his high-powered job in Los Angeles and heads to Emerald Springs, determined to help his father make the transition to retirement and quickly get back to his own life. What he didn’t count on was the pull of the one person he’d left behind to chase his dreams. This is the first book in the Emerald Springs series. This is Adam's and Zoe story. They were in love with each other from high school. But Adam had bigger ideas. He went off to L.A to start his career and left Zoe behind. As she waited for him but he never came back. When his dad calls him Adam coms home to help his father transition into retirement. He tries and hides from Zoe but his mind and his heart have other things in mind. As he sees Zoe for the first time at the warehouse on his fathers tea farm. The flames ignite and he starts to realize that maybe his life is here with her. There are so many sweet moments in this book between everyone. You feel the closeness of every member of the family. They love each other so much and it radiates through the pages. The way the story is told , it weaves a tale of betrayal of young lovers. The mystery of what is going on with the farm and love of coming together of two people that are destined to be together . The only thing that was wrong with this book . Is that it ended way too soon for me lol. I haven' read a good sweet romance in awhile so I devoured this book and so can't wait to read the prequel and then book two in the series. So if you like sweet romance books with a happy ending read this book you won't be disappointed .